Using hashtags to promote your event will raise awareness in advance, encourage attendance, and enable those who are there to track the event and those who aren't able to attend to follow along. To attract people to your event who may not be familiar with your event or your organization, use a hashtag that they might use to find events of interest to them, such as the topic, type of event, or location. You can search for hashtags within Twitter and on Google, and within some of the other social services. (See the list of several social services that support hashtags below.) There are also free tools, such as Hashtagify, HashAtIt, hshtags, and others, as well as tools with a monthly fee, that help you research and analyze hashtags. 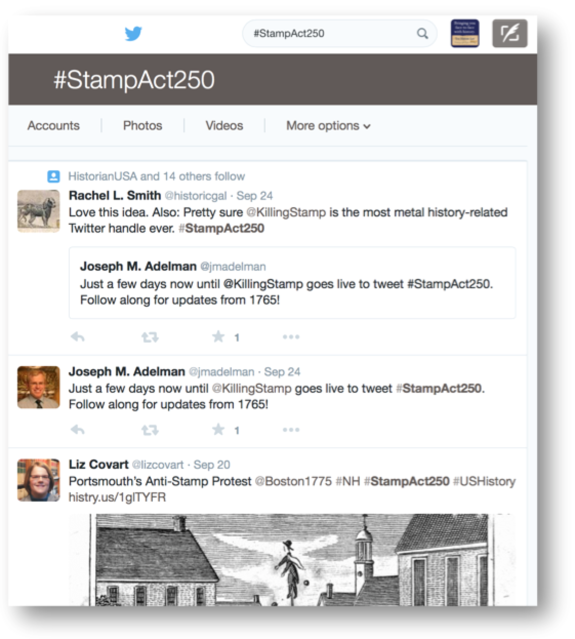 This example is from a search on Twitter and shows the hashtag that was popular for events, programs, and posts connected to the 250th anniversary of the Stamp Act: #StampAct250. To reinforce awareness of your own event, choose a hashtag for your event that's short and that, ideally, makes it easy for someone to connect it back to your organization. One of the frustrating things about hashtags is that it's often not easy to figure out the event behind a hashtag without doing a web search. Embedding your organization's name or the topic of the event helps convey some information without a search. These screenshots from Twitter show the way that the New England Museum Association (NEMA) promoted and used a hashtag for their 2013 conference. As you can see, they included it in their conference program (top), as well as other communications. Attendees included it in their tweets; a search on #nema2013 on Twitter returns all of the tweets that included that hashtag. The last screenshot shows the hashtag on the event page on The History List. We've added a box to the "Add event" form where you simply type it in. In addition to Twitter, hashtags can be used in . . .
Find one or more popular hashtags that are relevant to your target audience. Something like #history is too broad and used in too many ways for it to be useful to you. Create a hashtag for your event. Because anyone can create a hashtag, you have a better chance of activity focusing on your desired event hashtag if you get out in front and establish one early on. Check the hashtag you're thinking about using for your event to see if someone else has used it recently. Ideally, your event hashtag should be unique. It should also be short since every character counts against your maximum message length of 140 characters. Include it in your site, e-mail messages about the event, press release announcing it, conference program, and tweets about the event. Include it on your event page on The History List. Encourage your speakers and attendees to include it in their tweets. Include it on your signage at the event. 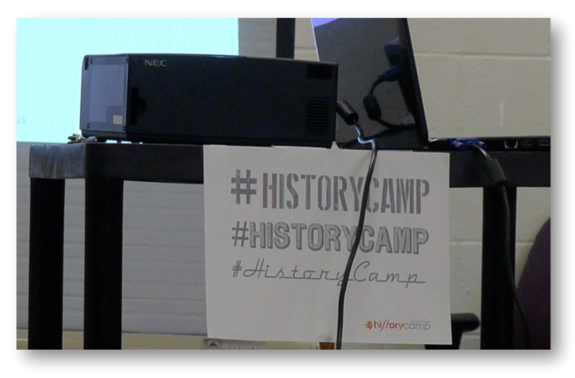 Post it in the session rooms and encourage your speakers to announce it as a reminder—Pictured at right, a sign with the #HistoryCamp hashtag in one of the session rooms at History Camp Boston in 2015. This one-day event had about 100 tweets and nearly 100,000 impressions. Your early tweets announcing your event and leading up to it might include both the topic hashtag and your event hashtag. These and other articles are included in the "Marketing tips for history organizations and historic sites" newsletter. The largest list of conferences and workshops for history professionals is on The History List. You can subscribe to a monthly e-mail with upcoming deadlines and add reminders to your calendar.